A fun idea is making meringue – meringue cookies, Pavlova, or meringue pie. These deserts look extravagant and are very tasty. Oh… did I mention gluten free! Just watch for the big smiles! Pavlova is a white, firmer meringue. It is used as a shell for deserts. Soft, fluffy meringue is used on top of pies and meringue cookies are generally firmer in texture. Meringues are basically egg whites, fine sugar, cream of tartar or other acid such as lemon juice which helps to keep the egg whites firmer. 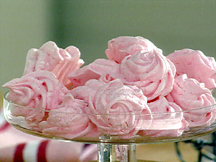 Meringues can be flavored, but are low in fat although there is some sugar involved. These goodies take a little time, because they are cooked at a low temperature and then need more time to dry after baking. Further drying the meringue can be done by opening the oven door part way, with the temperature turned off and allowing them to set overnight. Others just cool them on a rack. Each recipe offers a different drying method. Although there are few ingredients in meringues, there are some tips that will help you come out with a superior product. 1. Don’t use a plastic bowl. Any residue will make the meringues fail. Use a very clean, stainless steel or glass bowl. 2. Cold eggs from the refrigerator separate easier than room temperature eggs, but room temperature eggs whip to a higher volume. The remedy for this is to separate the egg yolk and whites from each other when the eggs are cold. Let the egg whites sit for 15 to 20 minutes to reach room temperature before whipping. If whipping eggs whites by hand it is suggested that you use a copper bowl. Too much work for me! 3. Make sure you don’t have even a little dab of egg yolk mixed in with the whites. It will ruin the whole batch. 4. Don’t over bake them, but they need time to dry after baking. Pavlova is a desert named after a Russian ballet dancer who while visiting Australia and New Zealand had this desert named after her. Which country actually came up with the desert is still a big controversy. Beat egg whites and salt until stiff but not dry – about 8 to 10 minutes. Add finely granulated sugar and lemon juice. Beat about 10 minutes longer; add vanilla. Bake in a spring form cake pan, in a preheated 400 degree oven. Turn off oven and leave inside for about 3 hours. Let it continue to cool in a warm area away from drafts. Remove from pan. Serve with whipped cream and fresh or frozen berries. Preheat oven to 300 degrees. Line a cookie sheet with parchment paper. Trace a 9 inch circle, with a pencil on the parchment paper using a cake pan. Beat egg whites until soft peaks form. In a small bowl, mix the corn starch and sugar together. Continue mixing and slowly add the sugar mixture until sugar completely dissolved. Beat in lemon juice. Spread meringue to fit the circle on the parchment paper. Shape to look like a swallow bowl. Bake at 300 degrees for 1 hour. Turn off the oven and let the meringue set inside for about 45-60 minutes. When cool, the meringue should be hard on the outside and soft on the inside When completely cool, top it off with whipping cream and berries. When all the sugar is dissolved and the mixture is firm, gently fold in chocolate chips and nuts. Use a Teaspoon or piping bag to place the cookies 1 inch apart on parchment paper. Place cookies in preheated oven and them turn the oven off. Leave cookies in oven for up to 3 hours or overnight. Just don’t forget about them and turn the oven on again! Preheat oven to 300 degrees. In a large bowl, beat egg whites, until soft peaks are formed. Add sugar, 2 tablespoons at a time. Continue mixing to make sure the sugar is completely dissolved. Mix in lemon juice. Fold in zest of the lemon. Drop by teaspoons on parchment paper lined cookie sheets. Place in oven for 2 hours. Turn off oven and leave the oven door slightly ajar for at least 2 hours or overnight. Store cookies in an airtight container. Preheat oven to 250 degrees. Line a cookie sheet with parchment paper. Beat egg whites with cream of tartar and salt until the mixture forms soft peaks. Add sugar, 2 tablespoons at a time. Beat mixture together until very stiff. Fold in raspberry jam and red food coloring if desired. Drop by teaspoon or pipe from a bag. Bake for 1¾ hours. Let the cookies cool completely, several hours or overnight. Yummy, low in calories, gluten free, fancy and a wonderful way to serve a special treat! Combine and cook over low heat; water, sugar, cornstarch and salt. Stir until the mixture turns white. Let cool. In a separate bowl, beat 3 egg whites until they are very stiff. Fold in cooled mixture. Spread on a lemon or chocolate pie and brown in a 350 degree oven for 10-12 minutes or until lightly brown.